Both will debut this week. Back in 2008 Lexus launched its “F” performance brand with the aim of making a dent in the luxury high-performance segment. Something like that does not happen overnight, but the Japanese brand has made solid progress so far with lots more planned. For this week, Lexus wants to commemorate a decade of its performance brand with the GS F and FC F 10th anniversary special editions. Both cars are painted in Nebula Gray, the first time a matte finish has been used on a production Lexus since the LFA. 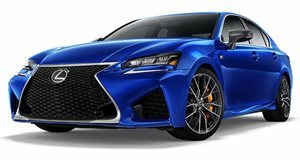 Lexus claims extra effort was made to ensure this special paint will be durable enough to handle everyday driving, such as trips to the car wash. Additional exterior features will include polished black multispoke 19-inch wheels wrapped in Michelin Pilot Sport PS2 tires. Blue brake calipers were added for that additional touch of exclusivity. The interior offers occupants all of the familiar luxury along with blue carbon fiber trim on the window switch panel and dashboard. Continuing with the blue color theme, there’s also blue leather accents Lexus says gives the interior a custom-made exotic look. The RC F features front sports seats covered in blue leather with white accents, a blue accented shift knob, steering wheel, instrument panel hood, and embossed headliner. The GS F has the same front seats as its coupe counterpart, but its rear seats receive blue leather on the side bolsters. It also gets more blue carbon trim on the center console and blue seatbelt straps. There’s also an engraved plaque to mark each car’s limited production status. 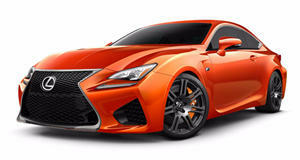 And speaking of which, Lexus says only 240 RC Fs and 100 GS F 10th anniversary editions will be built. Power for both comes courtesy of the same 4.5-liter naturally aspirated V8 we love, with 467 hp directed to the rear wheels through an eight-speed automatic. Lexus claims a 0-60 mph time of 4.4 seconds for the RC F and 4.5 seconds for the GS F. Lexus says additional option packages will be required for both special editions, and final pricing has yet to be decided. Deliveries are expected to begin this summer.